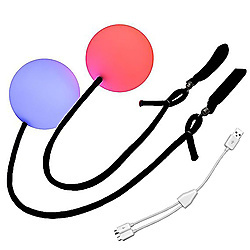 Having been in the market for a number of years and after several upgrades the Flowtoy's PodPoi have become one of our most popular LED Poi. palette, brightness or preset patterns can be selected or adjusted in each mode. It charges in 1-2 hours from USB power and most modes last all night or longer! Let the fun begin, order now! "My son wanted needed these for a talent show and all went great."